Renon, in the heart of Trentino Alto Adige, is just a few kilometers from Bolzano and it is a tourist destination since the early ‘900. It’s also a paradise for families with children, and it offers many different paths which are ideal for walking, through plains and mountains. The whole landscape attracts many tourists because it represents one of the most beautiful views of the Dolomites, which can be admired thanks to the historic Renon tram that runs through all of its beautiful surroundings. Among the most significant natural attractions, we can find the pyramids of Renon, which are particular geological formations which represent one of the most fascinating examples of slow and progressive nature’s evolution. There are also many cultural events, as well as the activities that you can practice, thanks to a small and wonderful ski area, and different sports facilities, which will make your vacation in Renon unique, especially because the place is fascinating for its romantic bells, its baroque buildings, the Roman-Gothic churches, and also for the old cottages with quaint thatched roof. In Renon you can stay at the Chalet Grumer Suites & Spa, where the watchwords are quality and exclusivity, with an extreme attention to details. 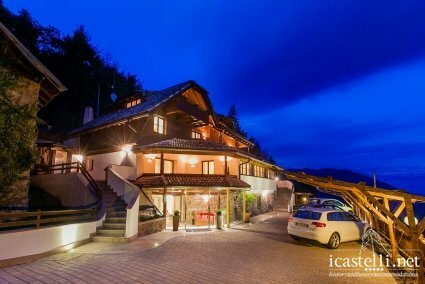 The Chalet is a unique and idyllic setting, nestled in the beautiful mountain landscape of the Dolomites, and it’s ideal for an unforgettable holiday to dream and relax, away from daily stress . This entry was posted in Design and SPA Hotels, Italy and tagged Chalet Grumer Suites & Spa, holiday dolomiti, holiday renon, hotels alto adige, hotels bolzano, hotels dolomiti, hotels renon, vacanze alto adige, vacanze dolomiti, vacanze renon. Bookmark the permalink.